Thanks to all who worked on and attended the 2009 Coulee Progressives State of the Union! Power cord for projector: anonymous angel! Thanks to everyone else for attending, networking, sharing, bringing great desserts, bringing food donations, helping to set up and helping to clean up! By tomorrow, we will try to have links/contact info for all groups represented at the Community Fair in case you missed someone. Please help us make this event bigger and better (yes, bigger IS better in this case) next year by completing the survey! Please feel free to add your comments! Have you been inspired and energized by Martin Luther King day events and the inauguration of Barack Obama? Here's your chance to get involved! The FIFTH ANNUAL Coulee Progressives State of the Union will be held on Friday, January 30 at the Concordia Ballroom, 1129 La Crosse Street. Doors open at 5:30 p.m. to the annual Community Fair - lots of local, regional and national organizations and groups letting you know what's going on and giving you the opportunity to sign up to volunteer. Of course, free food and a cash bar and wonderful music and lots of idea sharing will add to the enjoyment. At 7:30, Ben Manski of the Liberty Tree Foundation for the Democratic Revolution will speak. [UPDATE:] We will also get a preview of the new video Transportation Liberation and have a great look back at actions and events of 2008! Entrance is by sliding scale donation (we use entrance fees to help pay for the hall) and you are welcome to bring a dessert to share and/or a non-perishable donation for local food pantries. Groups, organizations, candidates who want table space during the Community Fair should email CouleeProgressive@hotmail.com. United For Peace and Justice encourages you to join this nationwide Congressional call-in day. This is the second such call-in day, organized by the Leadership Conference for Guaranteed Healthcare - National Single Payer Coalition. If you do not know who your Representative is or how to reach her/him, click on to congress.org -- and then enter your zip code on the upper right corner where it says "Find Your Officials". The Congressional call-in number is 202-224-3121. When you make the call, be sure to ask if your Representative is already a sponsor of HR 676. If they are, thank them and urge them to do all they can to help it pass. If your Representative is not yet a sponsor, urge them to become one now. (Visit Healthcare NOW for talking points.) They can also attend a briefing on HR 676 that will be held on Wednesday, January 28 from 3 to 5 p.m. in the halls of Congress. If you can make one more call, please call one or both of your Senators to support companion legislation to HR 676 in the Senate. The headline reads "Case could rewrite corporate law in Wisconsin” and arguments before the Wisconsin State Supreme Court begin this week. Wisconsin Manufacturers and Commerce has already made it known how it would like the Wisconsin Supreme Court to rule. And who can forget the millions of dollars WMC spent supporting corporate-friendly and ethically-challenged judges Michael Gableman and Annette Ziegler? Haven’t you had enough? It's time WMC-backed justices Gableman and Ziegler remove themselves from ruling on this case. Sign the petition below and demand Justices Ziegler and Gableman recuse from the Virnich and Moores case. In 2006, A jury ordered the owners of Communications Products Corporation, Daniel Virnich and Jack Moores, pay $6.5 million in damages after the pair took over $10 million from the company as they drove it into the ground. Dozens of workers were out of jobs when the company went under, and Communications Products Corp. refused to fulfill its union contract and pay workers their due. All the while, Virnich and Moores continued to collect huge payments from the company. When WMC gets its way, it means fewer rights for workers and more breaks for corporations. Labor lawyers have said that allowing owners like Virnich and Moores to get rich on the backs of workers would "weaken future collective bargaining agreements and companies' duties to meet their obligations." Please take just a moment and sign on to the petition demanding Gableman and Ziegler recuse themselves. But don't just sign—get five friends to sign too. Together, we'll stand strong with our workers and fight back against the corporate greed of WMC. I am writing to request you recuse yourself from participating in the upcoming case before the Wisconsin State Supreme Court involving the former Communication Products Corporation. As you know, oral arguments are set to start, Wednesday, January 7. Wisconsin Manufacturers and Commerce not only filed a brief at the appeals level but also reiterated its sentiments and desired outcome of the case in the media just days ago. Because of the millions of dollars spent by Wisconsin Manufacturers and Commerce which benefited both of your races for Supreme Court, your continued participation would raises serious concerns about your impartiality on this case. To ensure a Wisconsin Supreme Court with the highest ethical standards, I respectfully request you withdraw from participation in this case. 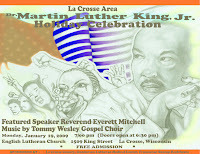 A community celebration and commemoration of the life and ideas of Dr. Martin Luther King, Jr. will be held on MONDAY, JANUARY 19 at 7 p.m. at the English Lutheran Church, 1509 King Street, La Crosse. The featured speaker will be Reverend Everett Mitchell, of the Madison-area Urban Ministry with music by the Tommy Wesley Gospel Choir. Doors open at 6:30. Free admission. Sponsored by La Crosse County, Gundersen Lutheran Medical Center and Franciscan Skemp Healthcare. Please print out and distribute the flyer! "It is not enough to say we must not wage war. It is necessary to love peace and sacrifice for it." Wisconsin Sen. Dan Kapanke is inviting constituents to his new La Crosse office for an open house Thursday. Kapanke, who was elected in November to his second term, will be on hand to take questions and talk about the 2009 legislative session. A projected $5.4 billion shortfall is likely to dominate most of the session as lawmakers struggle to balance the state’s budget. Visitors are welcome between 11 a.m. and 1 p.m. in suite 308 of the Exchange Building, 205 Fifth Avenue S. A light lunch will be served. The 2009 Coulee Progressive State of the Union will take place on Friday, January 30th at the Concordia Ballroom, 1129 La Crosse Street. The evening begins at 5:30 pm with a Community Activism Fair. Our keynote address will begin at approximately 7:30 pm. This year's keynote speaker is Ben Manski, Executive Director for the Liberty Tree Foundation for the Democratic Revolution. Mr. Manski will address this year's theme: A NEW DAY. A donation of $2 -$20 at the door will get you a simple meal and plenty of networking opportunities with other area progressives. As in years past, we will collect non-perishable food items for donation to local food pantries. If you are interested in volunteering, or would like to reserve a table for ther Community Fair, please e-mail Cathy Van Maren at cvmaren@mwt.net or Jessica Thill at thill.jess@gmail.com before January 15th.